How to get dramatic but graceful expressions on the faces of opera singers? I was aiming to make effective publicity photos for Opera Bel Canto of Washington, a small but expert concert-opera company then led by Micaele Sparacino. Asking vocalists to hold a pose instead of singing would drain away the emotion that makes opera exciting, I figured. But their expressions also had to reflect the extreme situations they were singing so passionately about, not just the heroic exertions of their singing. I shot dozens of frames while they rehearsed in costume, at moderate volume. 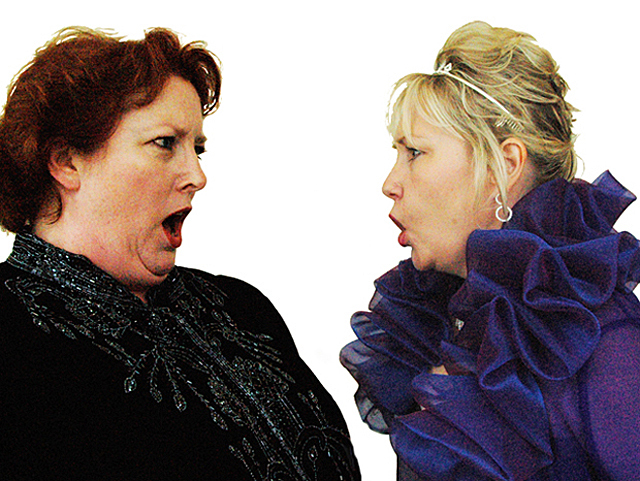 Above Debra Lawrence and Donna Darden — Lawrence as Mary, Queen of Scots, and Darden as Queen Elizabeth I — rehearse a duet in Donizetti’s Maria Stuarda (Mary Stuart). The queens disagree dramatically on many issues, including religion, Elizabeth’s right to the throne, and the affections of an earl named Roberto. Below, the queens are joined by tenor John Day as the earl, but their conflict-management skills are deficient, and Elizabeth orders Mary executed in the last act. Taking a lot of shots also yielded more than enough publicity stills of the leads of Maestro Sparacino’s April 2005 production of Bellini’s La Sonnambula, below — American-born tenor Antonio Giuliano and Bolshoi Opera veteran Tatiyana Abiyakiy. Below it’s likely that Ms. Abiyakiy looks deliriously happy because her sleepwalking character neither lost her honor nor fell off a bridge while asleep (though she came close).